Update 6/5/17 – Apple continues to trade in very small increments. The stock could potentially push higher one more time. It is at historical heights on the MACD and it likes to be flat or move lower when it reaches there. I am not expecting much from this giant but to rest. Update 4/10/17 – Apple has been flat since it has reached its new highs. There is some concern of a larger head and shoulder pattern developing. While its not that often to see this pattern develop sideways, it can happen. The stock does have a tendency to pause before earnings but it is also very overbought. 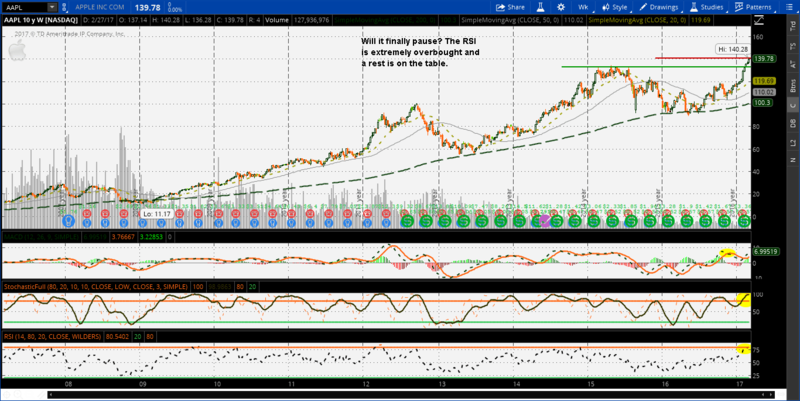 It may likely continue to hover near its highs and make a push to 150. Update 3/20/17 – Apple is hanging out at its new price and it has a chance to continue to linger. The last time it did this price action, it continued to push. My new target is now 150 because of this. Never fight a trend. Update 3/6/17 – Apple reached our price target of 140. It may likely start to rest now. The RSI is very hot and the chart shows that it likes to relax when it reaches there. Once the cool down is over, it will likely keep running. I will have a new price target once I see the signals of the next run.